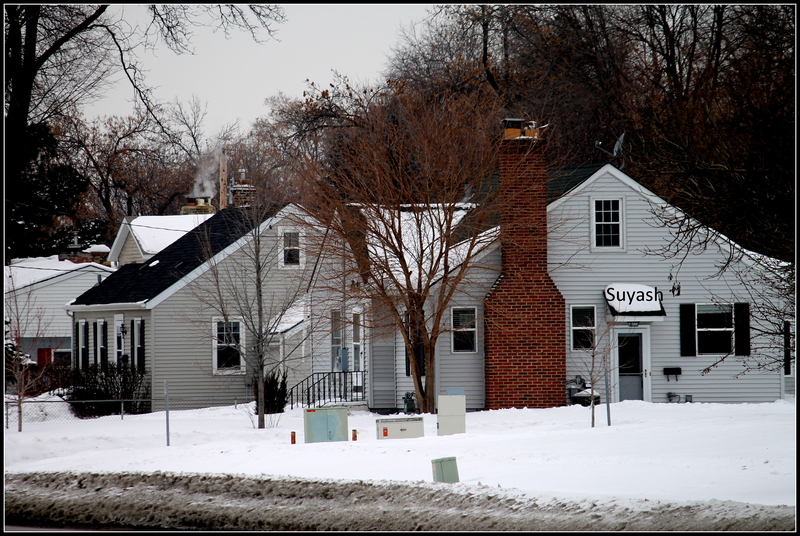 As my flight took off from Minneapolis – St. Paul International Airport, I had reminiscence of last two months that I spent in Minneapolis. A fortnight trip to Mexico and a weekend sojourn in New York were travels that my wife and I took during these two months. However, my stay in Minneapolis was characterized by its typical extreme cold weather. Sub-zero temperatures, hitting as low as -30 degree Celsius, snow showers, wind chills and heaps of snow outside my apartment had become a common thing for me. 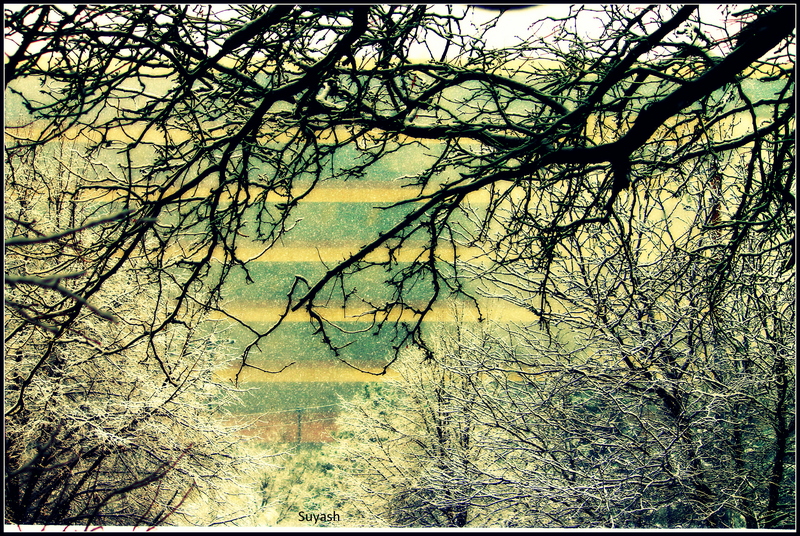 When it snowed, flakes of snow descending down the earth looked very surreal. Once I thought, may be, seeing so much bloodshed and pain on this earth, God has decided to send heaps of cotton to heal the wounds of mankind! Various coniferous and broad-leaved trees often received this God’s grace in priority. 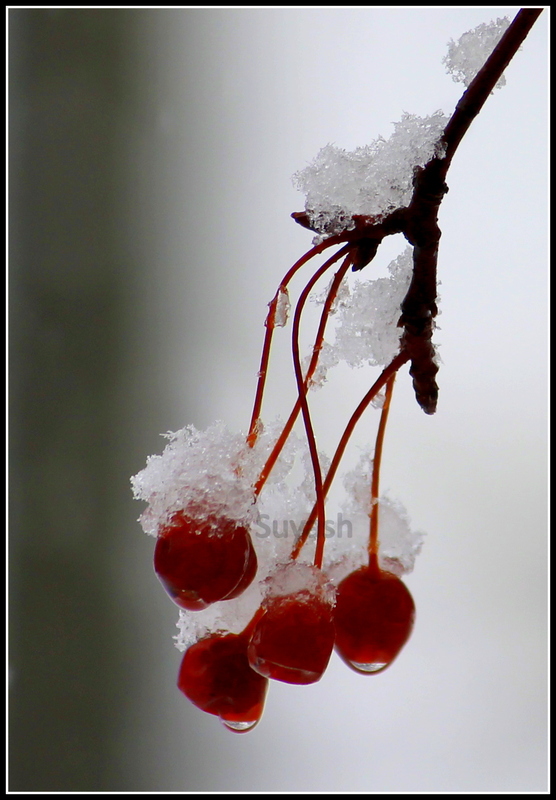 Snow perched on the trees had a heavenly sight and it shone in sunlight like gems. A blanket of white sheet had shrouded everything, and everywhere. Roads were, however, clear of snow. And pavements were fun to walk on with snow boots. Two months back in February, when my flight was preparing to land at the Minneapolis – St. Paul International Airport, I peeped down through the window. It looked as if some chaste messenger had enveloped Minneapolis in its white veil from all the ills of this world. Rivers, lakes and water bodies had frozen. One of the world’s largest river systems in the world, Mississippi river had also decided to hibernate and was peacefully resting beneath the formation of ice on the surface. It was a sight which I could never forget my life. A lifetime one! 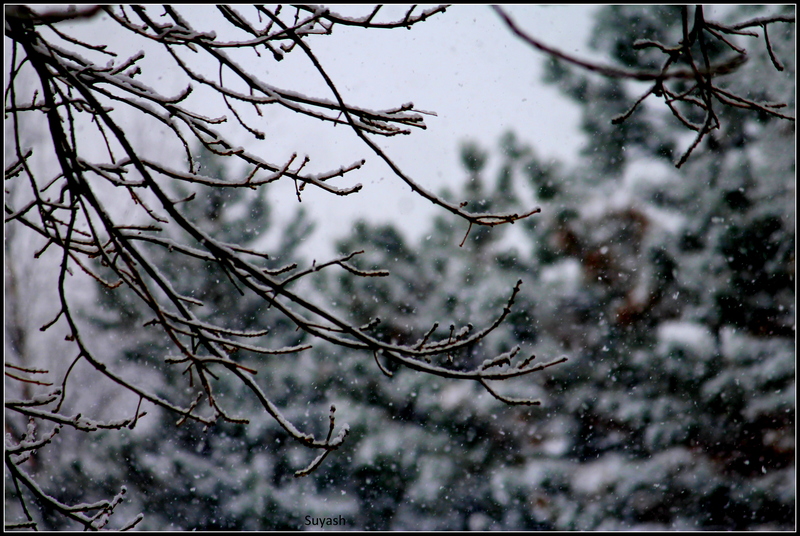 Wearing layers of clothes, I often used to venture out to experience what life was when it snowed in Richfield, where I stayed. Weather alerts and warning of wind chill and snow showers asked to us stay indoors. But I had ‘wheels in my legs’, as said by my wife. I was often walking out with my camera in that weather – waiting to see life turn to the other side. And I was not disappointed. 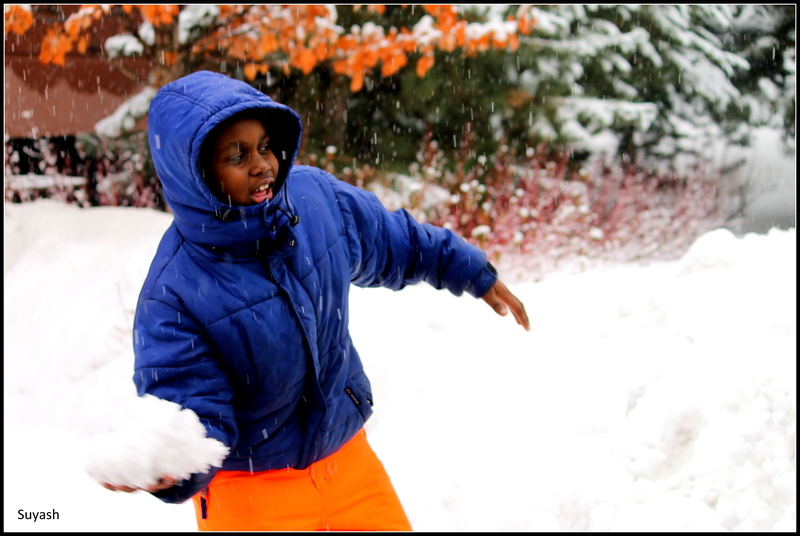 Since it was my first tête-à-tête with snowfall, it was all the more exciting. Like a child, I used to watch school-going children make and play with snowballs. A dark figure in the distance, surrounded with white all over, was of a jogger, who was undeterred by snow or wind chill. Very much like me. I must confess here that Minneapolis is infamous for its extreme winter and very low temperatures. Before reaching Minneapolis, whoever I told that I will be in Minneapolis for two months (Feb – March), I often was appreciated for taking the cold head-on. In the flight, I had met a lady who lived in Michigan. Let me remind my readers that even Michigan is a very cold place. She mentioned that despite being acclimatized with a cold place, she could not dare to visit Minneapolis during winter. That is the winter of Minneapolis for you. But did I have a choice? When it did not snow, sun was often in its full glare. But sun had misplaced its heat in its bright light somewhere else. Equatorial region? Probably. Forecasts of sunny day made my heart sing, expecting warmth from nature after having bored of in-built heaters in my room. But nature jigs the lesser morals. Minneapolis though was bright and sunny sometimes, was devoid of sufficient heat from the sun. This made the climate colder. However, this light was good for my aperture, aka photography. And that’s how I decided I gonna enjoy this so-called depressing weather. Towards the end of my vacation, I had no qualms of the weather. Snow had started melting. But it was time for me to descend on a new journey. I had lived my days with new experiences, learning and activities. Stay tuned for my next blog on Minneapolis – straight from Mall of America, the biggest shopping and entertainment complex of USA. Have you also been to Minneapolis in extreme winter? Or do you live there? Share your experience as to how you enjoyed the winter. 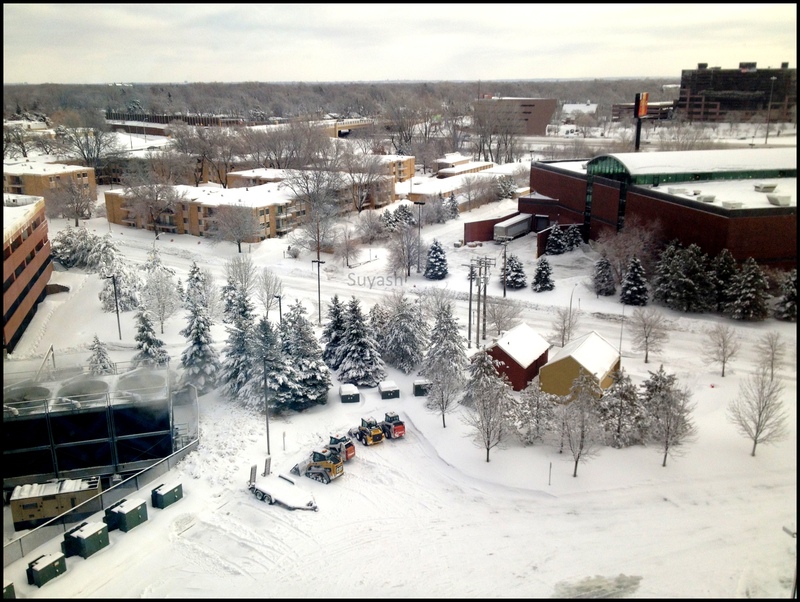 This entry was posted in Life, Nature, Travel, USA and tagged Extreme Winter, Life, Mall of America, Michigan, Minneapolis, Minneapolis – St. Paul International Airport, Mississippi river, Photography, Richfield, snow, snowfall, Travel. Bookmark the permalink. Thanks a lot dear. This was my first visit to such a cold place. I enjoyed my stay with my wife there and hope to come back in a couple of months – summer this time. Would love to see the contrast of winter and summer of MN. Glad that you liked it. These chairs are the fav place of dwellers during the summer when snow melts. But in winter, these chairs, though idle, are curious objects for photographers like us. Aha…now that’s a very good observation n different perspective….wow, I loved that honestly. Sometimes abstract photos lead to so many excellent interpretations n creativity in thoughts. Wow! Great set of photographs! Love it! Thanks for stopping by my blogs and for your appreciation. Glad that you liked them. Totally love the pictures. 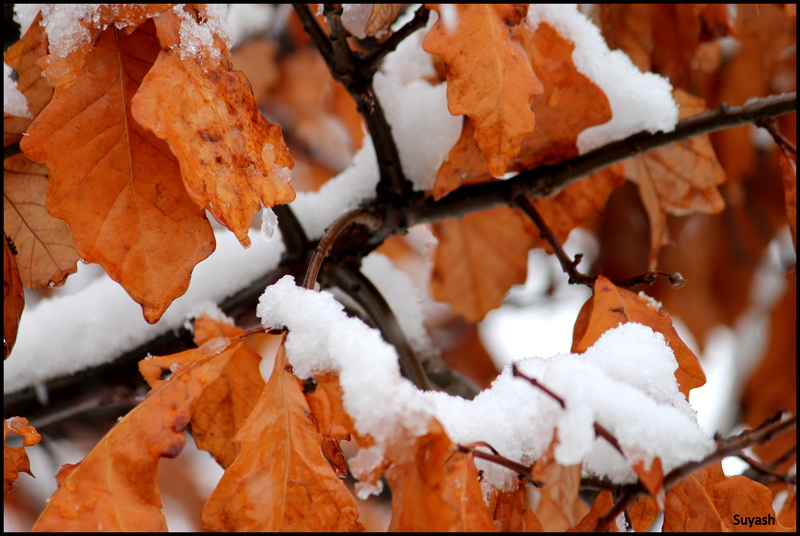 Particular appreciation goes to opposing the harsh weather and getting some beautiful snapshots! Thanks Deepti for your kind words. I am glad that you liked the pics. Deepthi… it was on a snow storm day he went out and took these pics… all people were leaving from offices and going home early that day and this guy is going out to take pics like crazy…i had to give him so many instructions of to be carefull, and don’t go too far from home…. blah blah…. Thanks Rajesh for your appreciation. 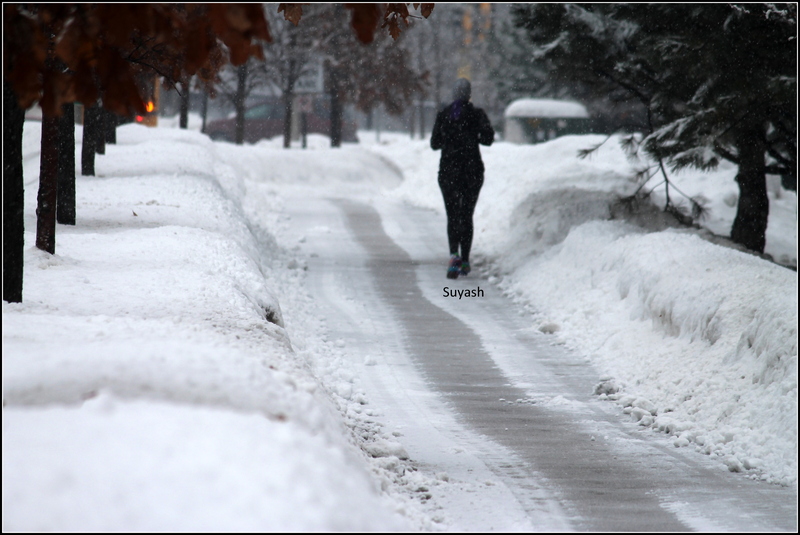 She was jogging on the pavement immediately after a heavy snowfall. That photo was taken standing at a bus stop and not from a window. Do let me know what makes you think so. Thanks a lot Mayank for your appreciation. Despite being a very cold place, the city has lot to offer in winter. Photographs to me, of course. Very beautiful place it is. My camera just keeps motivating me always. Beautiful snowfall outside n I Dont click it, is just beyond my thoughts. Thanks for your appreciation and inspiring words. They mean a lot. 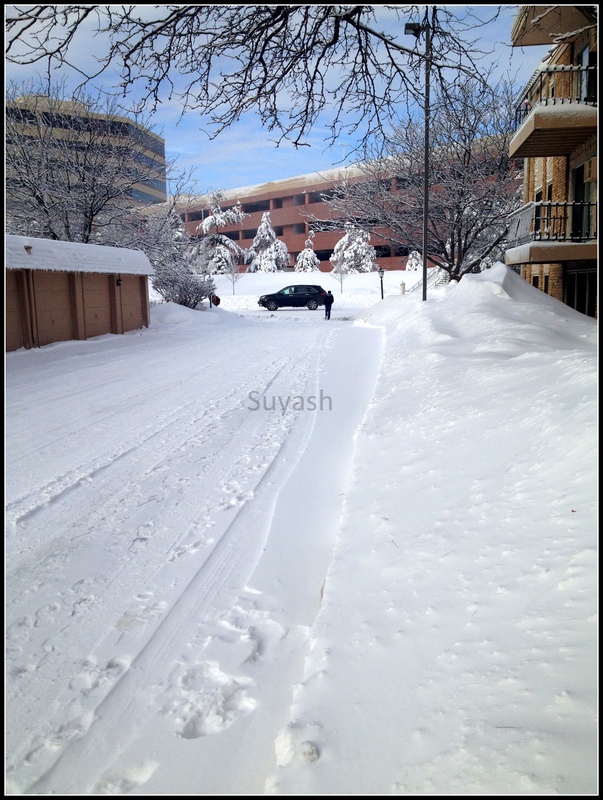 suyash, you could post the pictures on photographs and not just pictures.